I’ve decided that I should write a review for a beloved book series of mine. 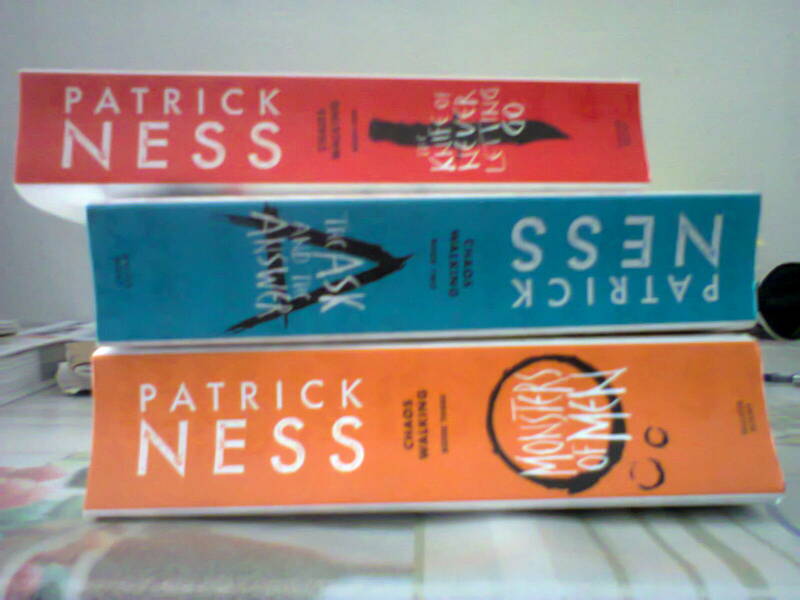 To be honest I’ve never heard of Patrick Ness and the Chaos Walking trilogy but I’ve heard wonderful reviews (4-5 stars at least) about it on tumblr and the books are wonderfully weird in an awesome way. Pardon the quality. My sister borrowed my digicam to take photogenic HD photos of her pet fungi (she’s a research assistant in a bio lab) and I’m left with a poor quality cameraphone. I want to do this so bad today so here we are, battling curiosity and hopelessness in judging stacks of papers. Look! See the invisible writings? The book cover is nothing short of glorious! So I should start with the first book. 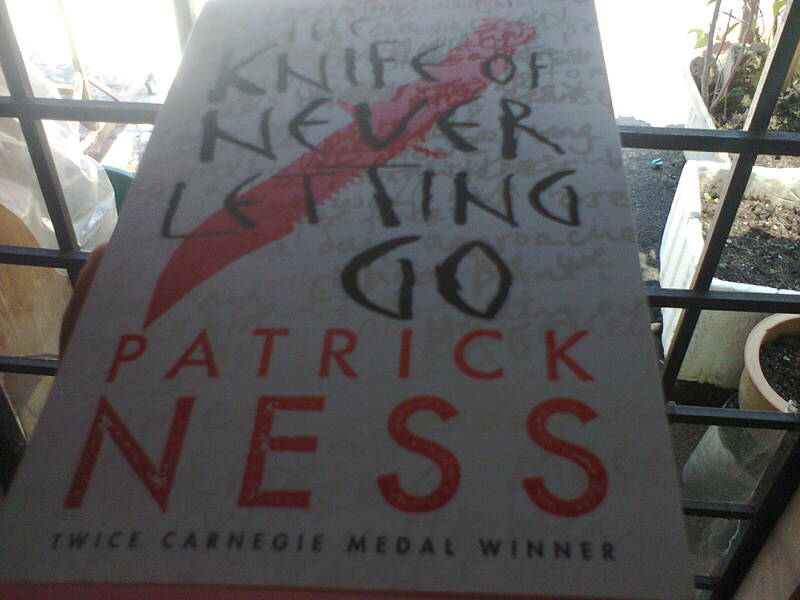 I loved the title ; THE KNIFE OF NEVER LETTING GO. We are to be presented with our hero, Todd Hewitt and fair warning for the faint hearted, his companion, Manchee. We’re presented with the New World, sort of new settlements (think American colonies in the 16th century but planet-wise) where in the sky you will find an extra moon. The new planet was inhabited by an ‘alien’ race called Spackle and they communicate by hearing each other’s thoughts. So when the new human settlers came, they did not expect to hear each other’s thoughts out loud. You will see it demonstrated in the book as below. 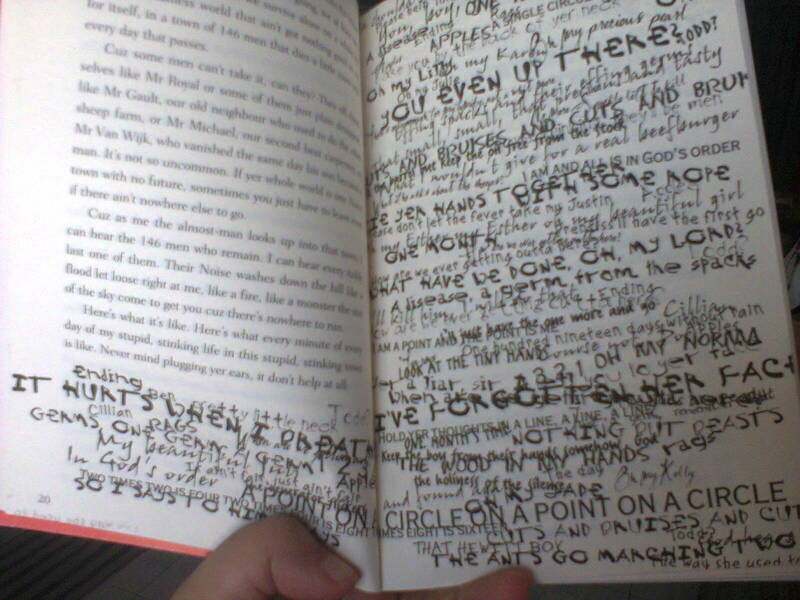 I’ve never seen something so random, pretty and wonderful as those bold scribbles. Those are called Noise. So our story began in a small town called Prentisstown (you can guess what’s the mayor’s name) where it’s been thought that the Spackle released a kind of germ to the humans making them hear their thoughts out loud (even the animals) and the Noise was not only annoying to men but it killed off all the womenfolk including Todd’s mom. Todd was adopted by his two fathers and he was the last boy in town whose going through the age of men – thirteen, but unbeknownst to him, his fathers thought of a way for him and Manchee to run away from their hometown before he turns 13. Mayor Prentiss had a horrible idea and Ben and Cillian didn’t want Todd to be any part of that plan. When Todd was walking Manchee out of town, he stumbled upon a spot of Silence in the middle of nowhere. When he told his parents, they immediately want him to leave. Todd didn’t like the idea one bit but he did it anyway and found out that the Silence moved. It was a girl and she fell from the sky. The whole Prentisstown was out on a hunt for Todd and he had to bring the girl along with him but how are you going to escape an army when they can hear your every thought? 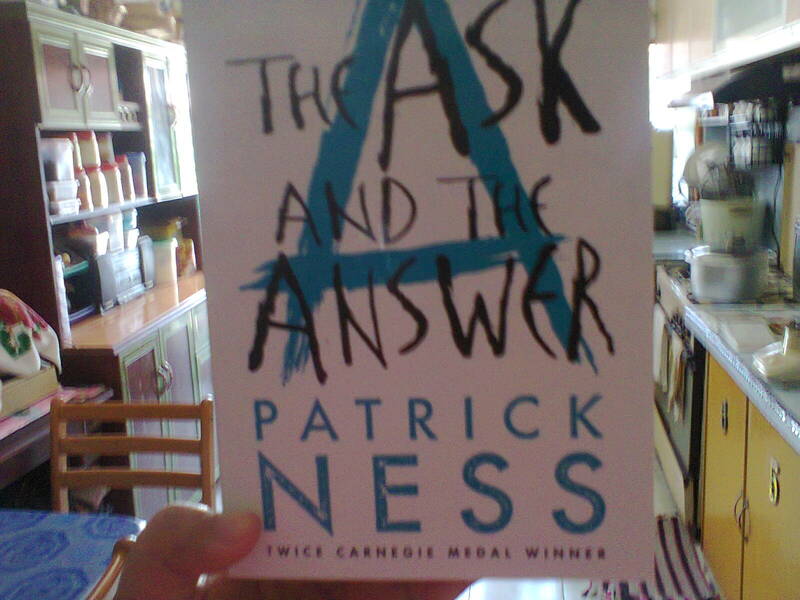 The second book is called; THE ASK AND THE ANSWER. Blue color. Lovely. This is my favourite cover. The story started with Todd carrying Viola (The Moving Silence) who was badly hurt to a new place called Haven, a supposedly safe and promised place. He surrendered to Mayor Prentiss’s army and was separated immediately from Viola. Meanwhile Mayor Prentiss conquered Haven and renamed it to New Prentisstown and hoarded all the cures for Noise. Viola was placed in a house of healing and while getting better, she also learned on how to be a healer like the rest of the women of Haven under guidance from Mistress Coyle. Unhappy with the new mayor, Mistress Coyle led a resistance movement called The Answer to carry out bombings in strategic places in the city. The other side retaliate with The Ask. Todd, working for the mayor now had to manage a herd of Spackles for municipal works and one day he saved a Spackle from a bombing. His balance shifted. Which side should he take, his employer, Viola or the ungrateful slave? 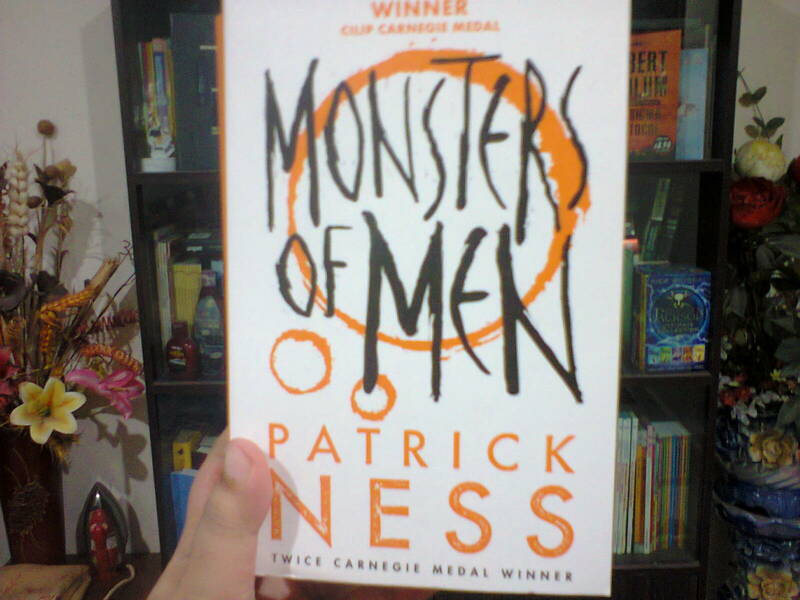 The last book is called; MONSTERS OF MEN. Spoiler alert; there will be war. The Spackle army was marching towards New Prentisstown and Mayor Prentiss was in charge of his own army while Viola was trying to communicate with a new spaceship bringing the next batch of colonists, new weapons and advanced technology. Which side will win? 1) The Knife of Never Letting Go was a very emotional book for me. I didn’t like Todd in the beginning. He abuses Manchee for no reason whatsoever! I hated him for being such an idiotic, whiny boy. I didn’t think he’d make a brilliant hero because he’s always scared and to be honest, he made a lot of stupid decisions. He can’t even spell and read. UGH. I thought he was going to get everyone killed because he was stupid. And I was wrong. I took everything back. Just read the book and tell me how you fell in love with Todd. 2) The Ask and The Answer discussed very delicate theme. It went deeper than most young adult literature (YA lit) ever did to me. I’ve read many YA lit discussing wars, propaganda and tactical but this book sent chills down my spine. It makes you think about the calculating mind reasoning behind a purposely destroyed public watertank and why people are ready to suffer to make the other side die/lose/break in a certain manner. We are cruel beings. It tells you how humans in war are not much different than monsters. You try to figure out the motives of leaders like Mayor Prentiss who was all about power and Mistress Coyle who talks about rights. You think of why certain people think that their opinion is valid enough to kill innocent victims. Why suicide bombers think that they can achieve something by taking their own life. Was it worth it, an eye for an eye? Man, the book is just brilliant. I loved the short story at the end of last chapter. I can almost imagine reading with Noise and I wanted to be a Spackle. 3) Monsters of Men was the most difficult read for me of all three. It discusses not two side of a war but three. One side is protecting their own country/people/rights (the Spackle), one side is fighting for power (New Prentisstown) and another side is fighting for survival (the latest colonists who came from a broken planet faraway) You’ll understand why there would be allies and peace treaty. There’s so many hidden things in the war that we saw on t.v and reading this book made me understand the world and the kind of people we live with. Overall it was a five star book for me 🙂 I don’t know if they’re making a movie out of this but it would be a challenging one that is. You’ll see.